Are you sure, you want to add Senna to your wish list? Are you sure, you want to order Senna ? Are you sure, you want to buy Senna? the most exciting driver to ever race formula one the handsome charismatic aryton senna became a brazilian national hero and an icon to racing fans worldwide but you need to know the first thing about racing to be thrilled and moved by asif kapadia's high octane docmentary composed entirely from archival footage it is an edge of your seat documentary that explores the backroom politics bitter rivalries and the glamour of a sport that leaves no room for error at the same time it is a chracter study of a near mythic genius who was a man of uncompromising humanity and grace.okay when i went to the theaters to watch this movie i knew it was gonna be good i knew it was a documentery i saw the full movie and it was sad at the end cause aryton senna the main chracter of the movie dies at the 1994 imola gp he was only 33 or 34 years old i think and a lot of people were sad at the time this had happen to him the movie was about 2 hours and was my money's worth im glad i went to see this movie!! 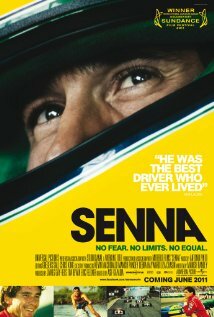 I don't watch too many movies but I was a Senna fan in the early 90's so I thought I would check this movie out. Awesome movie/documentary. Took my wife along who had no idea who Ayrton Senna was but she also enjoyed the documentary. If you like Formula 1, this is a must see. My Brazilian wife cried after watching such an Iconic figure triumph in becoming three-time F1 champion. well executed. This is a must see even if you are not a F1 fan!